At Google I/O, Google showed off its new jobs search tool that allowed you to find jobs without going to the dozen or so job search engines spread about the web. 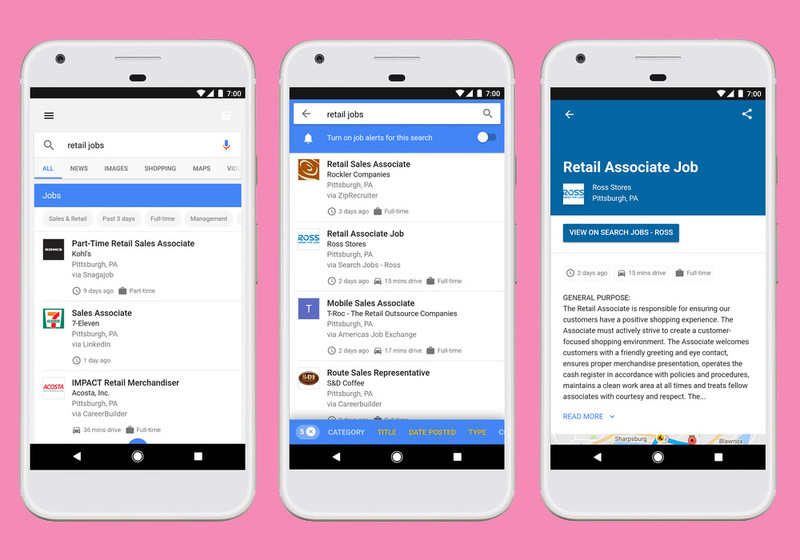 The tool pulls job listings from some of the big players in the game and puts them in a single Google-hosted location, while also providing things like notifications for jobs you’ve searched for. Today, that tool is live! All you have to do is head to Google and search for something like, “android engineer jobs.” You’ll then find a special Google result section with jobs, along with a link to dive further into them. Once on the jobs listing pages, you can then filter the results by level, date posted, location, company type, employer, etc. The listings are pulled from sites like LinkedIn, Monster, WayUp, Glassdoor, Careerbuilder, and Facebook. They show you full job listings, experience level required, and give you quick access to more information about the company. You can set alerts for the specific job searches you’ve done, plus you may even see commute times to the job in select markets. Again, this isn’t a special app or page within Google, you just get to it through Google Search. The results have been optimized for both desktop and mobile.